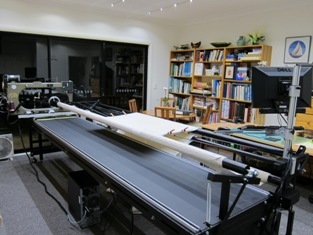 ...It has been about 3 months since the start and after a few 'major events', finally, the installation of my Gammill Statler was completed last week (1st December 2011). It is now working beautifully. Having been working in a world class Biomechanics Laboratory while studying at the University of Sydney, I'm enjoying the well-design mechanics of the Gammill Optimum. The computerised part of the machine, Statler Stitcher, is sensible and user-friendly. The possibility seems endless... I'm a relatively new member of Statler Sisters Yahoo Group. It is a wonderful group of Statler users/owners with a wealth of knowledge and experience. It's comforting for me to realise that help and support are within reach (via email) and that although isolated, I'm not alone. I'm now looking forward to spending time practicing and getting 'acquainted' with my Gammill Statler over the break during the festive seasons AND I can hardly wait.!! I did keep myself busy! !